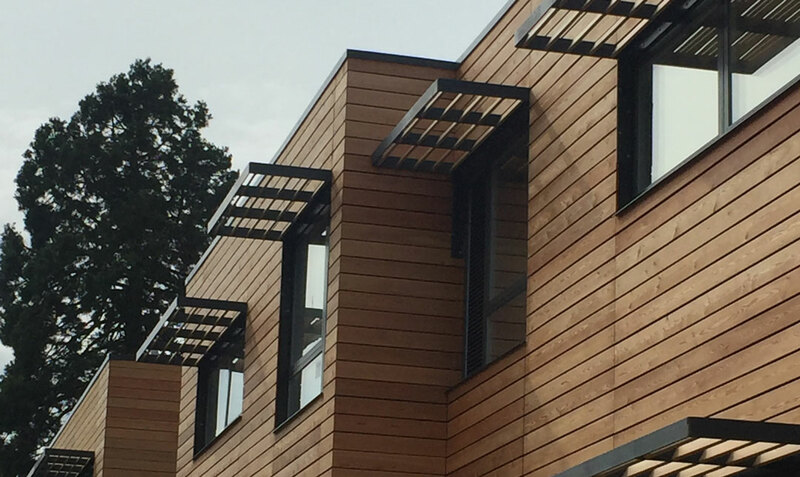 A residential accommodation development in the north of Scotland, in the pleasant town of Elgin, provided an opportunity for Scotstream to work in partnership with Morrison Construction in providing an effective brise soleil solution to the timber-clad façade. The solution was required to provide shading to the windows at first and second floor level along the south facing elevation of the building. As such, we designed and fabricated bespoke mild steel frames which would be fixed to the timber framing around the window reveal. As the frames were to be pre-fabricated, consideration had to be given to the little available tolerance within each bay, in order to ensure the functionality of the windows within. To each frame, 100mm x 20mm Russwood SILA Siberian larch blades were installed to complete the shading solution, with the timber complementing the same of the finished cladding façade.